Aaah, gravy. 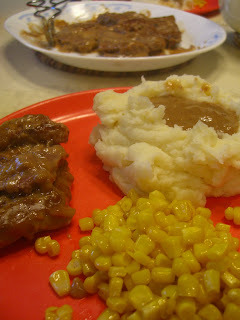 I've never met a gravy I didn't like (except for the fluorescent yellow stuff in a can). Since I've been in Ohio, I've encountered gravy in many forms and have come to realize its popularity in these here parts. When I was a kid, my favorite breakfast was brown gravy, a specialty of my grandma's. She would tear chunks of her dense homemade bread and smother them with a gravy she lovingly made by making a roux with bacon grease and a heap of flour, then slowly incorporating water and patiently stirring until thickened. No formalized recipe exists for my grandma's brown gravy - her mother used to make this for her twelve children (they obviously didn't count calories and carbs back in the day), so the method was passed down by oral tradition first to my grandmother, and then to me. My mom has her own humble version of a brown gravy. She says it's nothing special, but it's my dad's favorite meal and it reminds me of the stick-to-your ribs fare I ate growing up. Heat olive oil and butter in a large skillet over medium-high heat. Dredge the steak in flour and brown on both sides (you may have to do this in batches). As the steak browns, remove it to a roasting pan. Whisk together cream of mushroom soup, beef broth, and onion soup in a medium bowl. Once all meat is browned and in roasting pan, pour the soup mixture over meat. Cover roasting pan and bake for 2 1/2 hours. Remove to a serving platter and serve with Roasted Garlic Mashed Potatoes (recipe below) and corn. Slice the top off the head of garlic to expose the top of the cloves. Place the garlic in a square of aluminum foil and drizzle with olive oil. Season with salt and pepper and wrap the foil tightly around the garlic. Roast 30 minutes, or until the cloves are tender, sweet, and lightly brown. Allow to sit until cool enough to handle, then squeeze the cloves into a small dish. Meanwhile, bring a large pot of water to a boil. Add salt to the water and boil the potatoes until tender. Drain. Add the potatoes, butter, sour cream and roasted garlic to the bowl of a mixer. Mix at medium speed until potatoes are smooth and all ingredients are incorporated. Season with salt and pepper to taste. With all this gravy I've been experiencing over the past month, I'm happy to know that I won't need to experience gravy withdrawal in Australia. Phil and I stumbled upon a little Australian cafe called the Walkabout Cafe & Eatery in Jacksonville Beach. When I ordered my plate of Aussie Meat Pie and Chips, I was delighted to learn that it came with a mini-pitcher of gravy with which to soak my pie and chips! Apparently in Oz they even produce a specialized mini-pitcher for serving gravy! High five to the English for exporting meat pies and gravy to the colonies! There's one more special gravy I can't leave out - thick, rich, meaty Italian-American tomato gravy, slow-simmered for almost 4 hours. Served over spaghetti with a green salad and crusty bread, you couldn't dream of a better Sunday dinner. Heat the olive oil in a huge stockpot over high heat. Saute garlic and onions until tender, then add carrots and celery and saute, stirring occasionally, for 5 more minutes. Add tomatoes, tomato puree, tomato paste, basil, and oregano and mix well. Taste the sauce -if it seems tart, add sugar to taste. Add 12 cups water and bring the sauce to a simmer. Add beef bones, pork bones, and rind of Romano and stir well. Keep sauce at an active simmer for 3 1/2 to 4 hours, stirring occasionally. 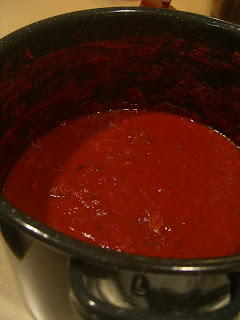 Let sauce rest in pot until it cools slightly. Remove the meat bones from the sauce and shred the meat with your fingers - return to sauce in pot. Taste sauce for seasoning. Serve over spaghetti. (any leftover gravy can be frozen for about a month, or used immediately to make lasagna... mmmmm). 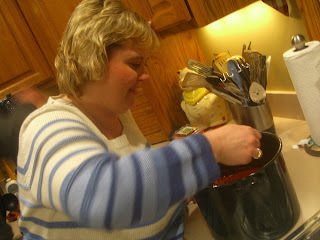 See, ma likes the gravy too!